(Tues., July 28, 2015) Who knew Southern Indiana was so beautiful? I had flown from San Francisco to Indianapolis and rented an SUV to drive two hours south on Highway 64 to the Uplands AVA of Indiana. My destination was Huber Winery, the largest and oldest winery in Indiana. Situated only a few miles from the Kentucky border, this part of Indiana is graced with gentle rolling hills, green valleys filled with orchards, rows of corn and vineyards. As soon as I turned on State Road 60, I saw charming farmhouses surrounded by large emerald lawns - many with small ponds featuring fat white ducks or chickens wandering around the yard. Every few miles a tall church steeple signaled a small town or village, with tiny stores selling fruit or local wares. I was delighted because I realized this was another one of the enchanting parts of rural America that made wine. There are so many parts of this country where winemakers are creating beautiful products that the rest of the nation does not know about. Nothing delights me more than discovering a new land of wine. The state of Indiana actually has over 80 wineries now, but just 9 in the Uplands AVA. Huber was established in 1843 by Simon Huber who came from Baden-Baden, Germany, and began planting orchards and vineyards. Today Huber is still family run with Ted and Dana Huber at the helm. I had met them earlier this year at a conference in California and they had invited me to visit. The estate is very large with 1000 acres of various crops, including peaches, berries, apples, corn, rye and 85 acres of winegrapes. They specialize in cabernet franc, blaufrankisch,traminette, and vignoles, but grow many other varietals as well, including an amazing tannat, an old world style cabernet sauvignon, chambercin chardonnel, and seyval blanc. In addition to the winery, they have an award winning distillery producing some of the best American brandy I’ve ever tasted, a large store that sells fresh fruit and vegetables, and an event center. The Wine Club is very active with over 1200 members. Total wine production is around 50,000 cases per year, including about 5,000 cases of fruit wine that is only sold locally. They hire around 70 full-time employees and swell to over 150 during harvest. Ted explained that their strategy was to create a sustainable family business that could create revenue year-round, rather than just based on winey harvest. Because of this they also offer many other seasonable products, such as pumpkins and apples in November and Christmas trees in December. Their most profitable segment is events, explaining the very large event center where they host corporate meetings and more than 80 weddings per year. Interestingly they have a 3-way alcohol license that allows them to produce and sell wine, spirits, and other alcoholic beverages in the event halls. The landscape is gently rolling hills with a mixture of clay, rock and limestone soils. Since they are warmer than other parts of Indiana, they can grow more vitis vinifera varieties, such as cabernet franc and merlot. However due to the humid summers and some heavy rains, they must spray with sulfur or other sustainable sprays every 14 days during the growing season to prevent powdery mildew. Probably the most interesting viticulture practice I saw the planting of Christmas trees in the small valleys between the vineyard blocks, because the frost forms in the valleys and it is too cold for grapes, but perfect for Christmas trees! Do You Know Where the Only Sparkling Meadery in the World is Located? First of all, you may be wondering what a "Meadery" is. The actual definition of "Meadery" is a winery that produces wine made from honey. This is an ancient technique, and mead can be found in many countries of the world. It is often a sweet thick wine, or can be made thinner with the addition of water, and take on the taste of a sweet beer. However, hidden in the coastal hills of Marin County, California in the small town of Point Reyes is the home of the only sparkling meadery in the world. Here the owners, make a still wine from honey diluted with 4 parts water, and then use the "methode Champenoise -- or traditionale method" to create sparkling mead. It is called Heidrun Meadery, and is located less than a mile from the waters of the Pacific Ocean along Tamales Bay,. Heidrun, from Norse mythology, is the name of a special goat that would produce mead in her udder. Mead was the only beverage that the Norwegian god Odin would drink, and it had to be from Heidrun. In keeping with the Norse mythology theme, the symbol of the winery is Odin's 8-legged horse, Sleipnir. Arriving at the tiny winery, established on the outskirts of the small town of Point Reyes, you will find a tasting room built into a green house, a small garden, and a barn-like building to produce the mead. Behind the barn are bee hives and a special flower garden to attract bees. Production is quite small at 900 cases, and everything is done by hand. The winery uses their own honey, but also buys honey from around California and Hawaii. It arrives in large sealed steel barrels that look like oil drums. First they soften the honey in the drum, then transfer to small stainless steel tanks for fermentation. They add 4 parts water, Champagne yeast, food for the yeast, and tartaric acid (though they won't say how much). Primary fermentation takes 7 to 10 days, then the wine is racked, boiled for clarification and to remove any wax build-up, and transferred into Champagne bottles for secondary fermentation. More yeast and sugar is added. Secondary fermentation in bottle takes 2 months. The bottles are then riddled on a large gyro-palate for 4 days until the yeast sediment moves to the mouth of the bottle. Next the wine is disgorged in the traditional process, but all by hand! The tip of the bottle is frozen, the bottle cap opened so the frozen yeast plug shoots out. Then the bottle is immediately corked, and the wire cage is applied. No dosage is added, so they have to be careful not to lose too much wine from the bottle when they disgorge. Next the sparkling mead is labeled, receives a foil and is ready for sale in several months. It is designed to be consumed in 1 to 3 years. We were allowed to taste 6 different sparkling meads. They were all quite unique tasting, depending on the type of honey used. Most were very dry, and some actually taste like beer. The nose was floral on a few, especially the California Orange Blossom which sells for $20 per bottle. Quite a good deal after seeing how much work is involved in the process of crafting the sparkling mead. After our tour and tasting at Heidrun Meadery, we drove about 5 minutes back into town to taste cheese at the Cowgirl Creamery. We then brought cheese sandwiches from their deli, along with a bottle of chilled rose and sauvignon blanc to have a picnic in the sun at their outdoor picnic tables. After lunch we wandered around town for a bit, peeking into shops, before driving back along Tamales Bay to stop for oysters. We were not actually sure we would be able to get a table to buy and eat oysters because the several places to stop for fresh oysters along Tamales Bay can be quite crowed. We were in luck, however, because Tomales Bay Oyster Company had some open picnic tables. Therefore we bought 2 dozen oysters, watched the lesson on how to shuck them, then proceeded to open and eat every last one! Delicious, but we wished our Heidrun Sparkling Mead had been chilled, because it would have been fabulous with the fresh oysters. A perfectly lovely day in Marin County! March 2015 - On our last full day in Panama we drove to the old city to do the walking tour and some shopping. Again it was a bit challenging traversing the slums and one-way streets, but easier in the daylight than in the nighttime as we had done previously. Using a tourist map, we managed to find the paid parking lot at the end of the peninsula on which the old city is situated. It only costs 30 cents per half hour, so 90 cents for our total visit. We wandered the streets and felt like we had gone back in time. Built in the 1600’s, this section of Panama City is currently being restored and is a Unesco World Heritage site. It reminded me of New Orleans, with ornate two-story buildings with balconies, beautiful old grill work, and huge carved doors. It is still only half restored and there is much construction going on, but the charm is apparent. I would like to come back in 5 to 10 years to see the complete renovation. We visited the historic plazas and 3 churches, including Igelsia San Jose that has the famous golden altar. We stopped in several shops where local artists were selling carvings, embroidery, leather bags, and jewelry. We also stopped by the president’s palace, but weren’t allowed to go in. It was very hot walking the streets, and we were dripping with sweat by the time we got back to our very hot car. Next we drove to Albrook Mall, which is the largest mall in Central America. It has all of the shops we have in the US, plus many more. I found the prices very good and bought some sandals and clothes. It is an inside mall and air-conditioned, which is nice. Later we headed to the Frank Gehry Biodiversity Museum, which took 10 year to build, but just opened 5 months ago. The exhibits are not yet complete, so the current $22 price tag is a bit of a rip off. I opted for the $5 temporary exhibits, which I felt were a good deal, but my friends who paid the $22 felt disappointed. I’m not sure why they are charging so much when the museum is not yet completed. The best part is the architecture, which is an amazing display of bright primary colored slanted roofs in red, blue, yellow, orange, and green. It looks like a giant child’s toy, but is apparently modeled after all of the bright colors in the Panamanian jungles, ocean and cities. Its location on the Amador Causeway, balanced between two bodies of water, is visually stunning. Plus the views of the skyscrapers of Panama City are excellent. Back at the hotel, we spent a couple of hours relaxing by the pool and walking the beach, before showering and heading out to dinner. Our last evening we had been planning on having dinner at one of the many restaurants just north of our resort, but they are all closed on Mondays. The concierge suggested Alberto’s, so we headed back to the Amador Causeway – only a 15 minutes drive – to enjoy a last meal of fresh seafood (see post on Wine & Food of Panama). March 2015 - Another day we drove from our resort to the Soberania National Park. It took about 35 minutes from the Intercontinental Playa Bonita Resort and was not that difficult. What was challenging was trying to figure out where the park started. There is no visitor center, but instead small signs listing the name of the hiking trails. Therefore, you must check the names of the hiking trails first. We stopped at the El Charco Nature Trail (Sendero Natural El Charco) and parked in the dirt parking lot. As we approached the trailhead, a smiling young man stepped out and told us it was $5 to hike the trail. At first we thought we had to pay $5 for each trail, but it turns out that you receive a receipt and can hike all of the trails in the park for that price. This trail is short and only takes about 20 minutes to complete the loop. We were given a map and started along the trail. It was a beautiful rainforest, complete with waterfall, stream, pond, swaying bridges, and signs that listed the names of the trees and plants in both Spanish and English. Kids would probably enjoy it, as you have to ford the stream in a few places, and one of the bridges was broken. In the US it would not pass any safety standards, but it was fun in Panama. We saw several birds, but no monkeys or sloths. We were hoping that there were be guides we could hire to explain everything to us, as there were in Costa Rica, but this was not the case. Next we drove to the Pipeline Trail (Camino del Oleoducto), which is quite famous for animal sightings, and about 20 minutes drive from the first trail. To get there you must cross a rickety railroad bridge over the canal and through the ghost town of Gamboa. Then you must drive on a very bumpy dirt road until the trail entrance. We hiked 2 km along the trail (which is a road), but only saw a few birds. We did hear the howler monkeys screaming, but couldn’t see them. Eventually we arrived at the Gamboa Rainforest Center where we bought some water. It was a $30 entrance fee, so we decided to pass. After that we hiked back, and saw a few more birds along the way, but didn’t know what they were. It would be nice if Panama trained guides the way Costa Rica does so that we could easily find a naturalist, rather than try to do it yourself. For a late lunch we went to the Los Largatos Restaurant in the Gamboa Rainforest Resort. At first we drove to the resort and walked around, but were told we could catch the buffet at the lower restaurant situated on the marshy part of the canal. This was a great tip and not to be missed. The restaurant sits on the edge of the marsh and we saw hundreds of birds, plus crocodiles and turtles. The Sunday buffet was only $25, and was excellent. Since it was so hot, we had Panamanian beer with lunch. My vegetarian friends were thrilled with the many vegetable and pasta options. As for me, I went to for the spicy Panamanian chicken soup and pork in gravy dishes. It is also possible to go boating from the restaurant, as well as hike on nature trails and bird watch. March 2015 - Renting a car in Panama City was an unusual experience. We reserved with Hertz and the check-in at the airport was normal, but the nice touch was they brought the car to the curb for us to climb in. No need to get on a rental car bus. The downside was that when we returned the car to the airport, there are no signs about where to return it, and we had to circle 3 times. Eventually, after asking several police officers, we were told that we should bring the car to the departure level and park it at the curb – but still no signs. Rather anxiety producing. If you rent a car, be prepared for this, and definitely be able to speak Spanish. The nice aspect of a rental car was that we were able to drive all over without many problems. We had GPS on our phones and this worked most of the time. The freeways are fine in Panama City, but the signage is lacking at times. People drive a bit haphazardly – more like being in Italy. I read there are good taxis and tours, but they are not cheap. The taxi from our hotel to town was $25 each way, and tours were all over $100 per person. So we drove to the Panama Canal Visitor’s Center quite easily and parked close by in their free parking lot. It was about a 30-minute drive from the Intercontinental Playa Bonita Resort. Entrance is $15, and this includes a 20-minute 3D movie about how the canal was built, as well as the opportunity to view the canal and walk through the 4-story museum. I felt it was worth it. We also went to the Pacific –Atlantic Restaurant and had a Panamanian beer with lime while we watched the ships come through the locks. It was an enjoyable 3 hours. That afternoon, we rested at the hotel near the pool and took a walk on the beach. That evening we drove the 15 minutes into the old city to have dinner at the Jazz Club in the American Trade Hotel and listen to Wynton Marsalis play a mean horn (see post on Wine & Food of Panama). A truly great day! I should mention that driving in the old part (Casco Antiguo) of Panama City could be a bit daunting. The roads are one way; there are many slums; and parking is challenging. Driving from Playa Bonita over the bridge and into the old town requires that you pass through the slums. The poverty and garbage are a bit scary. Though reports say Panama only has 25% of its citizens living in poverty, driving through this part of town makes you believe it is much higher. March 2015 – In between attending conference sessions, we managed to explore several parts of Panama City. The first full day we enjoyed the beauty of the Intercontinental Playa Bonita Resort, which is located 15 minutes north of Panama City just over the impressive Bridge of Americas. The resort is situated on a beautiful blond sand beach on the Pacific, with a view of the massive ships lining up on the horizon to wait their turn to enter the Panama Canal. There are many different types of seabirds that come to the resort during low tides, and brown pelicans and cormorants roost on the rocky formations offshore. Behind the resort are nature trails where we saw sloths playing in the trees. The Westin is also located along this beach. The swimming pools and beach beckoned to us, and we spent several relaxing hours swimming, reading, and wading in the ocean. The first afternoon we checked into the spa where I had a 50-minute hot stone massage and bath during their March special price of $95. There is also a great gym, as well as salsa dance and stretching classes each day near the pool. The resort has three restaurants, including the gourmet Light House Restaurant (see post on Wine & Food of Panama). I stayed in the Executive Club Level, and would highly recommend it. For only a few dollars more, I was given a 5th floor room - the top floor with excellent view. However, I should mention that all of the rooms have ocean views, but the lower ones are not as good, and the bugs can be worse. Mosquitos are an issue in the evening, but the resort provides free wipes. The other nice aspect of the Executive Club was the free breakfast every morning that was always changing, and including many local dishes, such as cheese empanadas and green enchiladas, as well as egg dishes. It also has very fast Wi-Fi, which the rest of the hotel did not. In the evenings, the club offered multiple appetizers and a free open bar with red and white wines from Chile, as well as a variety of spirits, including Tangeray (my favorite gin), and local rums and spirits. It was definitely worth it. March 2015 – There are no wineries in Panama, but there are plenty of wines in the restaurants, bars, grocery stores and occasional liquor store. Due to its location, linking Central America to South America, it is not surprising that the majority of the wine is from Chile and Argentina. However, we also found a large selection from Spain, and a few bottles from Australia and California – primarily Yellow Tail and Gallo brands, such as Barefoot and Apothic. A positive is that the price for wine in Panama seemed quite reasonable, and you could purchase a basic glass of white or red wine from South America in most restaurants and bars for $5 to $7. There were also some more premium selections priced at $10 - $14 per glass. The currency is the US dollar, even though Panama has its own money called the “balboa.” However since this is matched to the US dollar, the majority of establishments use the dollar, but occasionally they will give you change in balboas. Credit cards are accepted in most restaurants. I was in Panama with friends to attend a business conference and present a research paper. The temperatures in March average in the mid 90’s everyday, and for this reason we focused on drinking chilled white wines. However, I did see many people drinking red wine in the evenings around the bar and at restaurants. Of course the local Panamanian beer, Balboa, was always present as well as a plethora of mojitos and other tropical cocktails. We ended up buying three bottles of wines in different restaurants over the five days we were there. The first was an Argentinian sparkling rose called Bodega Norton Cosecha Especial for $40. We had this with sea bass in the Light House Restaurant at our hotel, the Intercontinental Playa Bonita. Both the service and the food was excellent, in a lovely setting overlooking the ocean, with white tablecloths, candlelight, and beautifully presented plates. Surprisingly the wine was not chilled though, so we had to wait about 15 minutes for it to rest in an ice bucket near our table. As I had tasted this wine previously, I was familiar with the fruity medium-bodied bubbly, which was clearly New World in style. Later I was given a tour of the restaurant’s impressive wine cellar that proudly featured Concho Y Toro’s top of the line wine, Don Melchor. The second bottle was at The Jazz Club in the old section of Panama City. The club is located inside the American Trade Hotel, and we ended up having dinner outside in a small alley next to the club. The reason for this was because when we arrived, we discovered that Wynton Marsalis was scheduled to play there in two hours. Since the club was small there were no tickets left to purchase, but we were told if we wanted to sit in the patio for dinner, we could still listen to him play. Obviously we jumped at the chance and ended up having an excellent dinner. This time I had local prawns served in a red sauce that reminded me a bit of a New Orleans dish. We ordered a bottle of 2013 Masi Tupengato Paslo Blanco from the Uco Valley of Argentina for $36. It was a strange blend of Pinot Grigio and Torrentes that was rather heavy on the palate and minerally in character – more like a Semillon. It lacked the floral notes we were expecting from those two varietals. Causeway. Sea bass and prawns are both local in Panama, and therefore very fresh – so I found myself ordering these dishes frequently. The restaurant smothered it in a white cream sauce however, which I wish they had not. Otherwise, the service was fine, and we especially enjoyed meeting the sommelier from the Dominican Republic who gave us a tour of their wine cellar. The only strange note was that the white wine was, once again, not chilled, and we had to wait 15 minutes to open it while it sat in an ice bucket near our table. We wondered if perhaps the cost of chilling white wine is too expensive in Panama and this is why we encountered this situation twice. · Empanadas: made of pie dough and stuffed with cheese, meats, and/or vegetables. May be baked or fried. · Bollos: made with corn dough and wrapped in plantain leaves. May also be stuffed with beef. · Patacones – sliced green plantains that are fried as small disks; similar to potato chips. · Ceviche: raw fish cooked in lime juice with herbs, garlic and onion. They also eat many dishes which are similar to those found in Mexico, such as tamales, rice, refried beans, enchiladas, and tres leches cake. Fresh seafood and fruit is abundant, and chicken, beef, and pork are common. January 2015 - Several days after arriving in Baku, I received an email invitation from Ibrahim Abdulrahimov, the Commercial Director of Yarimada Winery. He invited me to a private wine tasting and lunch at the Art Garden Restaurant in the Old City of Baku. Ibrahim was kind enough to pick me up from my hotel, and as we drove to the restaurant, he explained more about the winery. The name, “Yarimada” means “peninsula” in Azerbaijani. The winery is named this because it is located 40 minutes from Baku on the Absheron peninsula in the village of Nardaran, where summer houses and beaches that attract many tourists can be found. The peninsula is also known for its migratory birds, and they are using the symbol of the Hoopoe bird on their labels. They have plans to open a tasting room there because it a great tourist location, but still close to the city. The company was recently started in 2012 and is part of a holding company with many other products, including construction, juice, and water manufacturing. They own and operate 500 hectares of vineyards and buy grapes from another 500 hectares across the country. Though they have a small demonstration vineyard at the winery, they primarily source from Gabala, which they report the best grapes come from. Their winemaker is David Maisuradze, who is quite famous in Georgia. He is a consulting winemaker for Yarimada. They currently produce around 60,000 bottles per year, with plans to expand. With a luxury focus, the sales strategy is to place the wine in high-end restaurants and fine wine shops in Baku, and then slowly expand across Europe. They don’t want to be seen in grocery stores, and their price points range from $30 to $50 manats (1 manat = $1.26 US dollar), which is quite high for wine in Azerbaijan (in fact the highest prices I saw). Currently they produce 6 wines, and I was able to taste them all, along with a delicious meal of Azerbaijani grilled lamb, fresh vegetables, and local cheese and breads. A truly delightful tasting, which showed off the wines to great advantage. 2012 Yarimada Shiraz –a dry dark red wine with a hint of tar, spice, and mixed black berry on the nose. Larger firm tannins, moderate oak aging, and more of an old world style with some savory meaty notes and the distinctive touch of metal minerality I found in almost every Azerbaijan wine I tasted. Is it in the soil, the water? The wine is a little high in alcohol and finishes a bit thin. 87 points. January 2015 - Before visiting Azerbaijan, I did an Internet search for Azerbaijani wineries and discovered that Aspi Winery (http://aspiwinery.az/) is one of the most sophisticated in that they have a website in four languages. The other wineries either didn’t have websites, or they were not in English. Furthermore I was distressed to learn there was no “Wines of Azerbaijan Association,” to assist me in scheduling appointments. Fortunately Timur Mamedov, Commercial Director for Aspi Winery, was extremely responsive. He answered my email almost immediately and invited us to a tasting of wines at their business offices in downtown Baku. Since it was winter and time was limited, it was not possible to drive to the vineyards and winery outside the city. We were joined in the tasting by Jahid, the Marketing Director. Aspi Winery was launched in 2007 by the privately held conglomerate of Aspi, which also sells glass and helicopters. They built a brand new state of the art winery with a production capacity of 1 million bottles, but only produce about half that much currently. The winery is located in the mountainous region of Gabala at 400 meters (1200 feet), in the foothills of the Caucasus Mountains. President Ilham Aliyev actually visited during the grand opening of the winery. 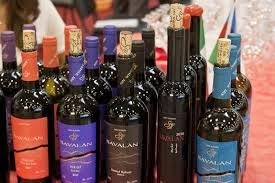 They have named the wine, Savalan, to honor the Savalan Valley in which the winery is located. The valley is nicknamed “sleeping beauty,” because it protects the people and plants that reside there from harsh winds, and is blessed with the beautiful river, Turian Chay. Currently they produce 18 different wines that feature brightly colored labels to distinguish the different varietals, and proudly display a stylized version of the mountainous valley in which they are located. Aspi farms 340 hectares of vineyards along the slopes of the mountains. The region of Gabala is an ancient wine making region, which has a dry sunny climate with highs up to 40 C in the summer days, but with a drop to 27 C at night. Afternoon breezes and the higher elevation also moderate the temperature a bit. Winters can be cool with average temperatures dropping to around 0 C at night, and occasional snow. The soil is a mix of clay and small pebbles, and is currently not irrigated, but they are considering adding drip irrigation. Trellis systems are generally VSP with short double guyot. They have planted 22 different varietals, with a focus on classic grapes, such as Chardonnay, Riesling, Merlot, and Syrah, with a few exceptions such as Alicante Boushet, Aleatico, and Marselan. They are also experimenting with unique blends, such as Grenache, Syrah and Alicante Bouschet in their Limited Release Reserve, which won a Bronze medal at the 2014 International Wine & Spirit Competition. The winemakers, Mr. Daniel D'Andrea and Ms. Eliza Vagnoni, are from the Friuli region of Italy. Much of the equipment and grapevines are also imported from Italy, as well as oak barrels from France. Current sales are in Azerbaijan and Russia, which a focus on fine wine shops, restaurants, and upscale grocery stores. “We do not want sell to shops that do not have good temperature control for wines,” said Timur. “If a shop places wine in a hot window and a customer buys it doesn’t like the taste, then it reflects poorly on the brand. We are focused on producing the highest quality Azerbaijani wines.” He mentioned they have plans to begin exporting to Europe and the US. In a tasting of 10 wines, alcohol levels were surprisingly high ranging from 13.5 to 15%. Despite this, the nose was quite fresh and exuberant on the majority of the wines, especially the whites such as the unoaked chardonnay, riesling, viognier, traminer, and muscat. I’m assuming some of this could be a result of the Friuli winemaking experience and style. January 2015 - It had been 18 years since my first visit to Baku, Azerbaijan in the Spring of 1996, when I was working for Amoco Oil. My memories were of a black city covered in grimy oil and soot, dinners of caviar and sturgeon, and sweet reds wines along with gritty white sparkling wine. Arriving again in Baku for 10 days from Dec. 26, 2014 to Jan. 4, 2015 was like walking into a futurist city. Everything was clean and sparkling, and there were many new buildings with amazing architecture like the Fire Towers and the Heydar Aliyev Cultural Centre. A long pedestrian walkway wove along the shores of the Caspian Sea, dotted with palm trees, fountains, and flowers, where black oil rigs used to be. Baku had transformed itself into a modern city - similar to Dubai, in some respects, with great oil wealth - but also managed to preserve its ancient culture and remember its wine heritage. Today the abundant restaurants are filled with the fresh local flavors of the land, specializing in some of the tenderest lamb in the world accompanied by fresh herbs, pomegranate sauces, rice, naan breads, vegetables, fruit, and local cheeses. Some say Azerbaijani food is similar to Persian (its neighbor to the South) or Turkish (its neighbor to the West), but experts say it has its own unique cuisine, and I would have to agree. Probably one of the aspects I loved most about this country is that, though it is 93% Muslim, they still drink wine. 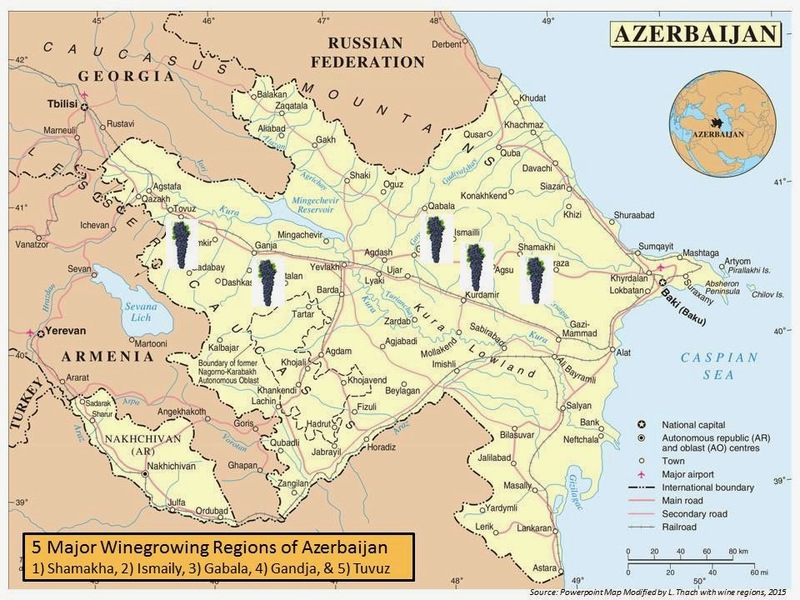 Wine in part of their ancient heritage, because Azerbaijan is nestled along the Caucasus Mountains, which are the birthplace of wine, in the country of Georgia (their neighbor to the North). Today, much of the wine is still slightly sweet, but they are also making dry styles from classic European grapes. Azerbaijan is called the “Land of Fire,” because as far as records go back in time, visitors described the flames that burst from the ground and never went out. These fires are from natural oil gases below the rocky surface, and it is still possible to visit Yanar Dag (Fire Mountain) where the flames have burned for thousands of years. While in Baku, I tasted many wines from Azerbaijan and was able to visit with two wineries. The people I met there told me that wine has been produced in Azerbaijan back to the second millennium BC. Proof comes from the archaeological digs of places such as Karabakhlar and Galajig, where stone fermentation and storage vessels were found with grape seed residue. Through the ages there have been frequent references to the high quality of Azerbaijani wine by ancient Greek, Arabic, and Roman scholars such as Homer, Herodotus, Al-Masudi and Pliny the Great. However, when I returned from Baku and was writing an article to publish regarding my winery visits, Jancis Robinson contacted me regarding her new book, The World Atlas of Wine, 7th edition, and the section on Azerbaijani wine. She said she had been in contact with Dr. Patrick A. McGovern who mentions evidence of grapes and possible winemaking dating to the 7th Millennium BC at Shomu-Tepe in his book Ancient Wine. Shomu-Tepe is located near Tuvuz in the northern region of Azerbaijan near the Georgian border. Therefore, I contacted Dr. McGovern and he confirmed this. Consequently wine has been produced in Azerbaijan much longer than previously thought, and continued to develop over the centuries. Even with the adoption of Islam, wine continued to be produced in Azerbaijan, and in the 1820’s attracted foreign investment from German immigrants who established operations in the area near Ganja, and ushered in Azerbaijan’s modern winemaking era. It was only in the 1980’s under Soviet rule that Azerbaijan’s wine industry was halted for a nearly a decade by Mikhail Gorbachev’s edict against drunkenness. In an act similar to America’s Prohibition, thousands of acres of vineyards were destroyed in the USSR. However with the fall of the Soviet Union in 1991, Azerbaijan has slowly been rebuilding its wine industry. Today there are five major winegrowing regions: 1) Shamakha, 2) Ismaily, 3) Gabala, 4) Gandja, & 5) Tuvuz (see map). Currently the growth trend for Azerbaijan wine appears to be positive within the country, though increasing at a modest pace. This progress is due to government support, improved wine quality, and a slump in vodka sales. Also, according to Euromonitor, more young and middle aged people in the country are consuming red wine. I was able to find wine in every restaurant I visited, as well as the bars, grocery stores, and even small convenience shops that seem to be on every corner. Though many may be surprised that a predominately Muslim country produces and consumes wine, one of the cultural aspects Azerbaijan prides itself on is tolerance. Not only are there many Christian churches and Jewish synagogues mixed among the Islam mosques, but there is a wide acceptance of Western clothing with women wearing all of the latest styles, and shops such as Tiffanny’s, Gucci and Zara doing a booming business. The expat community is strong, and the economy, in general, is doing well, though the recent drop in oil prices is hurting them somewhat. On my last night, we had dinner at a restaurant serving local cuisine in the Old City of Baku. This is an amazing warren of small streets filled with shops and restaurants and surrounded by the ancient fortress walls. The famous Maiden’s Tower, dating from the 7th century AD, is also located here. I had ordered the delicious local soup called Dushbara to start. This is made with small lamb dumplings, broth, spices, and fresh herbs. Next I ordered a green salad, and then grilled lamb chops with cilantro scented rice. My wine choice was a glass of semi-dry Rkasiteli to start, and then a glass of Matrasa (also called also Madrasi), the Azerbaijan signature red grape varietal that can be made either dry or semi-sweet. My glass was the dry style, with the black plum and earthy notes I was expecting. It was perfect with the lamb, and as I glanced around the restaurant I was pleased to see a table of four Azerbaijani women in their 20’s sitting near me. They were talking, laughing, and toasting with wine glasses filled with red Azerbaijani wine. (Summer 2014) Another afternoon during our two week stay in Nice to attend a French language school, we visited Chateau Bellet de Cremant in the steep hills above Nice. It was actually only a 10 minute drive from our gite that we rented in the hills, and is about 20 minutes from downtown Nice. The Bellet AOC is the second smallest in France, after Chateau Grillet in the Northern Rhone. Bellot includes only 70 hectares of vineyards and 10 domaines (wineries). They do not advertise and there is no tourist office with maps to help you find the wineries. Instead you have to drive through the tiny winding roads in the steep hillsides above Nice until you see a small sign signaling a winery. Once you find one, it is necessary to call and make an appointment. Alternatively there are two open houses per year, if you arrive on the correct date. The only winery that is open to tourists without an appointment is Chateau Bellet de Cremant, which is the largest. It is an impressive structure that looks like a small castle with stone walls, gates, and towers. A special feature is the massive stone balcony that provides amazing views of the Mediterranean Ocean and Nice far below. Technically it is considered to be one of the only wineries in a French city, though really it appears to be in the far rural outskirts of Nice. The winery was established in 1906, and built on the site of an ancient Roman galley, where they stored treasure. Now that portion of the chateau is used for the barrel cellar. Another interesting story about the chateau is that the original owner used the logo “CC” for Chateau Cremant, but when CoCo Chanel apparently visited in the early 1900’s she fell in love with the logo and adopted it for her own. The owner, who adored her, gave her the right to use the logo and changed the logo of the chateau to “CK” – not nearly as exciting. However the original “CC” logo, which looks just like the famous logo used by the House of Chanel (one of my favorite places), can still be found carved into the walls and above the main door. We visited the tasting room and were greeted in a very friendly fashion, though we did not have an appointment. The service was excellent, and we were told the history of the estate, invited to walk through the facility and vineyards, and given three wines to taste. In terms of production, the Chateau has 15 hectares of grapes and produces 40,000 bottles of wine per year. They do not export, and only sell at the winery and in select wineshops and restaurants in France. The red grape for which they are most famous is the Braquet, which originally came from the Braquetto region of Italy. It produces a lighter colored red like pinot noir, and has similar berry flavors, but a more earthy note. 2013 Rose ($17E). 50% Braquet and 25% Grenache and 25% Cinsault. Crisp but with soft tannis and rounder on palate. Bigger mouthfeel from the Braquet grape. Drink young - within 2 to 3 years of release. 2011 White ($20E) – 95% rolle and 5%chardonnay. Aged in 100% new oak barrels for 50% of wine. Tasted like heavily oaked chardonnay, but more of old world style. Vermentino eclipsed by oak, but good acidity, with buttery ML. Aged 3 years in bottle before release. Signature wine. Very unique. Altogether, we enjoyed our visit to Chateau Bellet de Cremant, and would gladly return again in the future. (Summer 2014) During our two week visit to Provence with French language classes every morning in Nice, we managed to slip away one afternoon to visit Maison des Vins de Provence. It was about a 50 minute drive from Nice and easily accessible from the freeway, where we exited at the town of Les Arcs. A large sign signals the entrance to a cluster of buildings, which include the welcome center and tasting room, a wine shop, restaurant and the administration buildings for the Maison des Vins de Provence. There is ample free parking in the large tree-shaded parking lot in front. We were welcomed by the hospitality manager, and later by the director, Francois and marketing manager, Celine. I was impressed with the friendliness of the well-trained staff, and the fact that we were allowed to taste 14 different Provence wines free of charge. Then if you decide to make a purchase – which we did – you receive a discount on the wine, as well as wine cooler bags. We were told that the 14 wine selections are changed every few weeks. Celine informed us that there are 400 domaines in the Provence AOC and that 230 of them are represented at the Maison. The center is supported by the French government as part of their wine tourism and regional promotion service. Other wine regions of France have similar wine tourism support. As we tasted through the wines, we were told that Rolle (Vermentino) is the main white grape of Provence. It is one of my favorite grapes as it produces a light refreshing lemon-lime wine with high acidity. 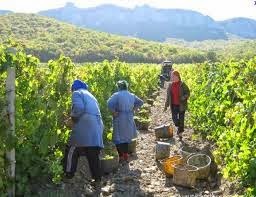 The roses are produced from grenache, syrah, mouvedre and/or cinsault, with some potential addition of clairette and ungi blanc. While we were tasting a family with small kids came in, and the mother and father were allowed to taste a few wines while the children were happily occupied with toys in a corner of the room that was set-up as a play center. Very clever! We purchased two rose wines along with a darling white plastic bag that serves as an ice bucket for the wine. They look very appealing on a table with the sun shining through the clear ice filled bag with a chilled bottle of rose nestled inside. Francois and Celine were kind enough to recommend a local restaurant for lunch, called La Bastide des Magnans. They even called to make reservations for us. The experience was incredible, with a three course meal served in a garden under giant plane trees. The chef even came out to welcome us and ask how we were enjoying the food. It was a true gourmand experience. Later that afternoon we visited the famous Le Thoronet Abbey, which is an ancient Cisterian Abbey with amazing architecture. On the way back to our gite in the hills of Nice we stopped in Cannes, and took a walk on the beach, and then visited several of the expensive shops along the boulevard, including Chanel. That evening, back in our gite high in the hills above Nice, we feasted on local pork chops, fresh vegetables and cheeses, and a chilled bottle of Provence rose while we watched the sun slowly slip into the ocean in the distance.